Now that it's 2018, VoIP is also getting older yet, more updated! VoIP services are going strong because of unparalleled mobility. 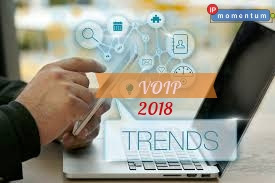 Moreover, VoIP developers have this constant urge to improve technology- say hello to a lot of excitement in this hopeful year, 2018. I hope you know- this year expects to experience 5G mobile networks! Therefore, leaving a great impact on VoIP calls. As per updates, 5G is 10X faster than 4G implying, reduction in issues like echoes, jitters, packet losses and so much more. With that amazing upgrade in a network, download speeds, video conference quality etc. in VoIP services by several VoIP providers across the world will get better. Get empowered by this little yet, wonderful change! For the record, artificial intelligence or AI has great implications for VoIP systems. The beauty of AI is that it has the ability to recognize bad quality calls, low bandwidth and so on. It is anticipated that AI unified communication program shall analyze conversations, speech patterns and e-mail correspondence in no time, in order to produce essential insights into sales performance as well as customer behavior. Here's a note for marketing firms- try out VoIP services this 2018 and enjoy a guaranteed improvement in customer services and sales tactics. Say hello to smarter voice assistants! AI, this year, is predicted to be able to answer calls too! All thanks to AI champions like Siri, there is immense improvement in voice assistance and language processing. AI is also getting better at abiding by simple commands, having different interactions with customers. Take this, for instance, voice bots are now being able to handle simple FAQs and on the other hand, the customer services agent are resolving more complicated issues. If implemented for the best, you and the rest of the world will see the best results this year. Until last year, there were quite a lot of PSTN service phones or, landline phones which were just sad. It was a pitiful scenario- people paid Rs. 3/ min for calls and the landlines didn't even work half the time! We all know PSTN is going to cling on to us forever, maybe. However, the number shall become minimal which is a good thing. VoIP migration is a must this year because of these upgrades which won't cost you too much! Believe and live a smarter choice from the business perspective as well as a personal perspective. Or else, the world shall go ahead of you and you'll never know!